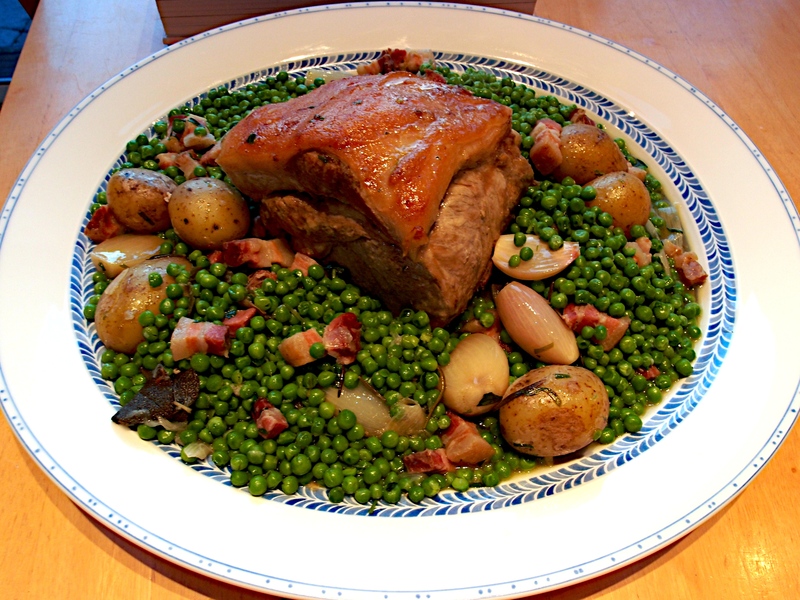 Here is the promised second recipe from Pork & Sons. We don’t usually do traditional Sunday lunch style food in the summer but this looked suitably summery so we have made an exception. A really impressive lunch for friends and looks great served on a great big plate. If you don’t have herbs growing in the garden we suggest you go raid someone else’s! There are some dishes where you can’t stop eating, even if you are totally stuffed … and this is one of them! Heat the oil in a flameproof casserole. Add the pork and cook over a medium-high heat, turning now and then for 8-10 minutes, until golden brown all over (make sure you get good colour at this stage as it won’t go any browner). Lower the heat, add the lardons, shallots and garlic and cook, stirring often, for about 10 minutes, until the shallots are softened and lightly coloured. Pour in the white wine and add the sage leaves, thyme, rosemary, bay leaves and onions. Cover and simmer, basting often, for an hour and a half. If it seems to be drying out, add a little water. Near the end of the cooking time, cook the peas in salted boiling water, then drain. Add the butter, tarragon and basil to the casserole and stir in the peas. Season and serve. Wine suggestion: We had something a bit special with this – a Ch. Rayas white from 2001. For a similar effect go for a white Côtes du Rhône – if you’re lucky enough to be in possession of a Ch. Rayas then run with that!